Professor Amanda Simson joined the faculty in September 2017 as an assistant professor of Chemical Engineering. Her background is in using heterogeneous catalysis for alternative energy technologies and air pollution control. Currently, she is working on off-grid power production using locally sourced fuels. As a teacher, Professor Simson is dedicated to improving educational opportunities for students, particular in STEM. She enjoys developing game and creating engaging science curricula for kids as part of the Science Ninjas team. Professor Simson is also part of an NSF funded project developing biotech curricula for community college students, with collaborators at Bronx Community College. Prior to her PhD work, Simson taught middle school mathematics for three years, two of which were with the Team for America Miami Corp. 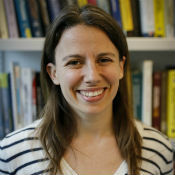 Professor Simson received her bachelor’s degree in Aerospace Engineering from the University of Virginia and her PhD from Columbia University Department of Earth and Environmental Engineering. Her graduate work at Columbia focused on developing efficient hydrogen production process for PEM fuel cells and was sponsored by BASF. After her PhD she spent two years developing hydrogen production technologies for Watt Fuel Cell in Port Washington, NY. Professor Simson currently teaches the Thermodynamics sequence and a graduate level elective in Environmental Catalysis.